As most everyone knows, preseason scrimmages and practices are not the best indicators for in season success. However it is nice to hear that Miles Plumlee has been one of the best players in practice thus far (Seth Curry being the other). In his senior year he seems poised to play up to his potential. He’s big, athletic, and he can play great defense and be a great rebounder if he really threw himself into it. Furthermore he’s slowly shown an emerging offensive game throughout the years. Hopefully he’ll be able to develop a consistent jump-hook and/or mid-range shot. Thus far he has only been able to dunk, but his dunks are amazing. I’m not going to temper my expectations for Miles because I’ve loved him ever since he committed to Duke. I want him to dominate college basketball this year. I want 35 points, 18 rebounds and 7 blocks a game. I want him to pump-fake like Tyler Hansbrough so he looks like he’s having a seizure on court. If medics aren’t around to prevent him from biting his tongue off each game then he isn’t playing the game right. I’ve been disappointed by everything I’ve read about Mason Plumlee. It seems he has regressed compared to last season. Reports have indicated that he’s been awkward with the ball and just awkward around the court. Mason Plumlee came into Duke with the highest rating of any of the Plumlee brothers but has not lived up to his lofty expectations. We saw him dominate games when he had Kyrie Irving feeding him fantastic passes last year, but he slowly disappeared after Kyrie went down with his injury. Mason Plumlee has the ability to dominate on his own, but he just seems to freak out all the time. He looks extremely nervous on the court and doesn’t play with any sense of flow. It’s frustrating to watch him because he has the talent to play extremely well but he can’t link his physical abilities with his mental abilities. We all saw the jump Nolan Smith made from his sophomore year to his junior year and Mason Plumlee could do the same. He has the potential and lets hope he can grow into it. 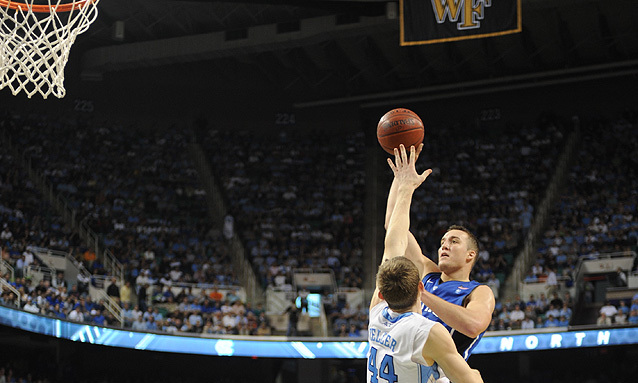 There hasn’t been much said about Marshall Plumlee because he hasn’t done enough to make an impression. Marshall seems remarkably raw and it will take him a while before he can be a key contributor to the team. I have faith in him because he does the best Scheyer face impression of anyone since Jon Scheyer himself. Marshall can sit back and learn this year because he is fifth-string for big men on this team. Mason and Miles have to step up into being contributing player rather than being the role players they have been up to this point in their careers. If they are successful then Duke can be successful this year. This entry was posted in Duke and tagged Marshall Plumlee, Mason Plumlee, Miles Plumlee, Preseason, The Plumblebees. Bookmark the permalink.